What is the art of Japanese calligraphy at its essence? Descriptions abound, but to see, to feel, to view through the lens of a Madrid photographer and filmmaker captivated by the process is to enter fully into the experience. Music accompaniment with only a few words for identification makes for a ten minute view from which anyone, from beginning student to the most experienced practitioner, can learn something of value and be inspired. Curious minds will be caught in the eye of the beholder and carried smoothly along in the quiet journey. Now that you have watched the film, a brief description; Learning the art of Japanese calligraphy begins with 一, いち, ichi, one, one stroke, the first stroke learned. It is much much later that one can become a calligrapher, a practitioner of Japanese calligraphy, 書道, Shodō, The Way of the Brush. Image text: Calligraphy by Kazuo Ishii, Autumn Poem, 136 cm by 34 cm. Training in calligraphy involves the reproduction of Kanji characters and kana using The Four Treasures, brush, ink, paper, and inkstone, and techniques employed for several thousand years. Preparation and focus and relaxed breathing develops alongside learning. Constant practice and concentration are essential as one begins again and again. Discipline develops instinctive movement. A character, a paragraph, even a single stroke of a character, is not created in isolation. Each part is an integral piece of the whole. Consideration is given to the texture of the ink, the grade of the paper, the choice of a brush and that of the inkstone with which one mixes the ink. Finding a rhythm is essential as there are never corrections in calligraphy, never going back into a stroke. Kaoru Akagawa, 赤川薫, a Master of Japanese calligraphy, explores the merging of traditional kana and modern art, developing her own unique style. In one article she explains fully the importance of stroke order, the traditional. In another she explains her philosophy of art and how she journeys toward the modern. Master Kazuo Ishii, born in Japan, began to practice calligraphy at the age of nine. After graduating from Waseda University he studied calligraphy, seal making, ink painting and journeyed in calligraphy, exhibiting his work in museums internationally. In 1997 he moved to Kiryat Tivon, Israel where he established Shiboku Studio, teaching, demonstrating and exhibiting his work and leading tours to find The Four Treasures in Japan. 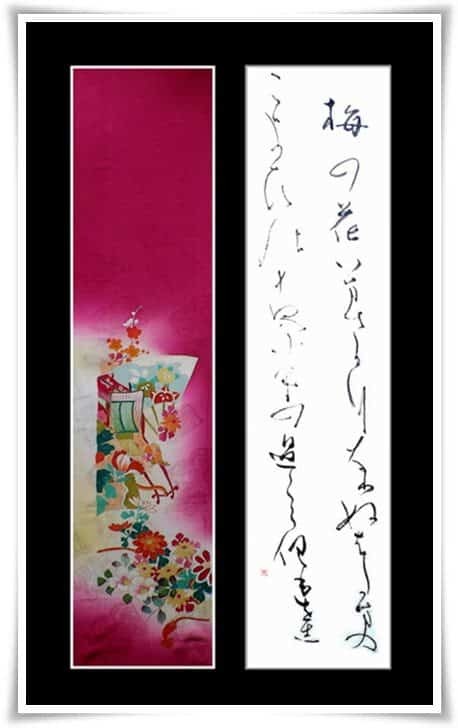 While his work has a broad range into the very modern, pictured is a traditional scroll in Kaisho style titled “Autumn poem.” His website can be read in English, Hebrew and Japanese. Calligraphy is not simply the art of writing characters well. The calligrapher strives to cultivate complete concentration, flowing rhythm, meditation, and a contemplative disposition. Inspiration is the final ingredient to create great works of calligraphy, a highly cultivated art form. Kaoru Akagawa and Kazuo Ishii are prime examples of what is meant by living the Way of the Brush, 書道, Shodō. Great post! I’m planning another Shodo video in a near future. Will keep you informed. Happy to read your comment, could you please tell us what drew you to make this video and give us more background? By all means continue to keep us informed of your future plans.